It’s hot, so I only have energy to show you a couple of photos. I expect there will be only one or two more entries in these chronicles, as we are nearing the very end of our project. We have a new kitchen. We’re almost moved all the way back in. I love it so very much. I never imagined having a home this wonderful. 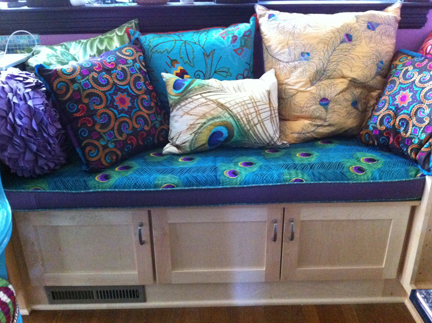 One of the last pieces to fall into place was this bench seat cushion, which only went in yesterday. This is where the pillows I showed you the other day live. 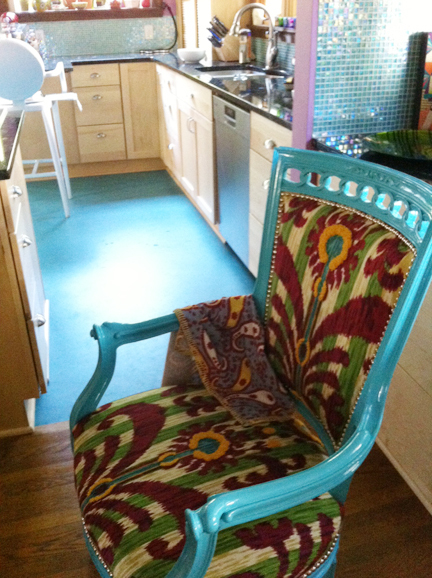 I love love love the bench seat fabric, it played a very important role in the colors of the kitchen. 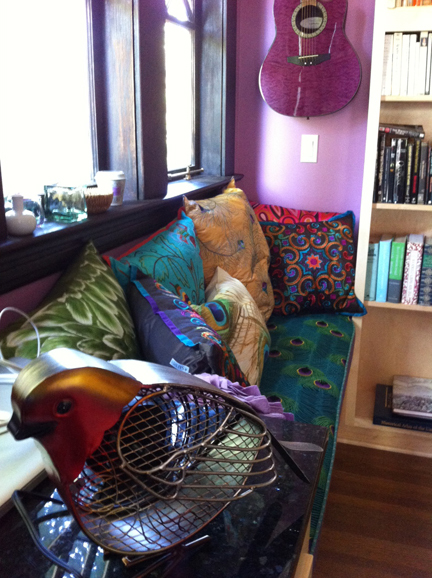 I can’t resist showing you another view of cushion/pillow land, featuring Ric’s purple guitar at one end. And please note the adorable fan I found that’s perfect for a Portlandia kitchen. It’s running right now, in fact. And this is my view while I am sitting at the table creating a blog post. Still life is good. 🙂 So is life. 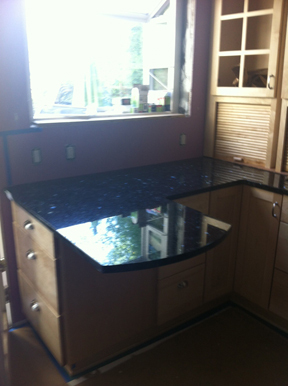 More glimpses of the almost finished kitchen. This time in morning light. This is the view from my morning office today, it’s too hot on the second floor where my regular office is, so I have my laptop set up on the kitchen table. 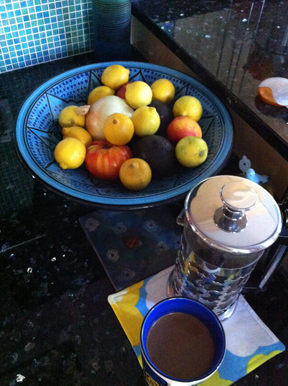 I even made coffee, which means our kitchen is no longer cookless… and these chronicles will come to an end soon. And this is what the chair I’m sitting in looks like when I’m not sitting in it 🙂 Isn’t it divine?! And the dishtowel almost matches it. Yes, I do realize I am ridiculous. In case you were wondering. Here’s another little pop of red I forgot to show you last time. 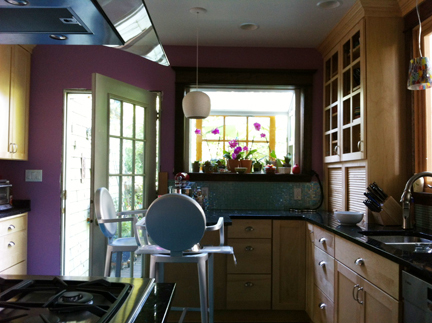 Whenever and wherever there’s an opportunity to display the color story of the kitchen, I take it. 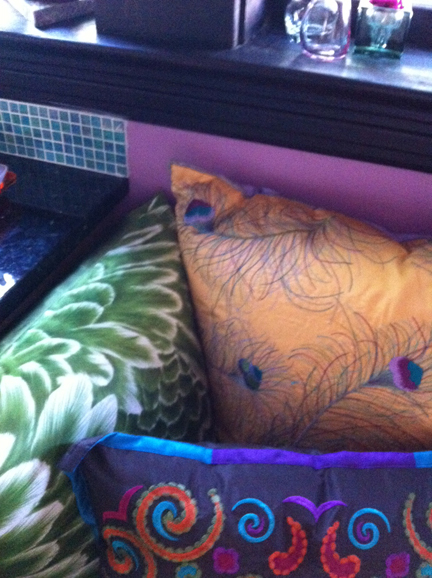 And have I mentioned how much I love pillows? Naturally, we put a bird on it. 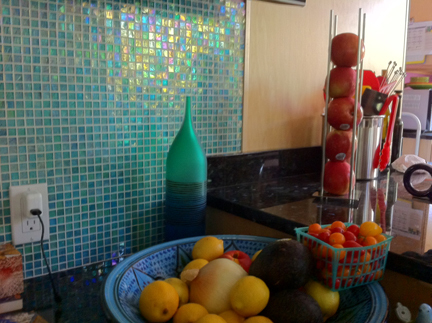 This is a Portlandia kitchen, after all. If you ask me what I’ve been doing the last few days, my answer will be something to do with the kitchen. Mostly moving back in. While there are miles to go before we sleep, I’m posting a few photos as, well, more than appetizers, let’s call them the first course. 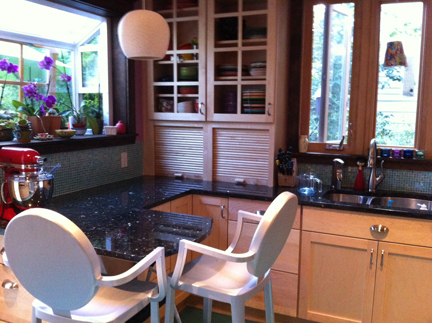 This photo looks at the southwest corner of the kitchen, you can see the upper cabinets, the countertop that includes a little extension that accommodates two bar stools, and a ceramic pendant light that is really cool. 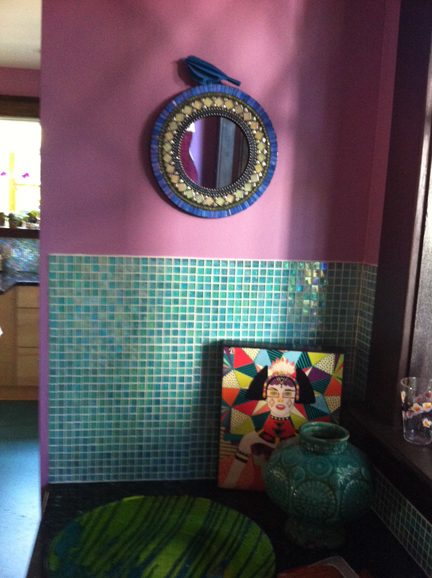 On the right side is the sink with another pendant, this one made of Venetian glass. Please note the orchids are back in the garden window too! See how the slits in the ceramic shade cast pieces of light that look like bamboo leaves when it’s dark in the room. 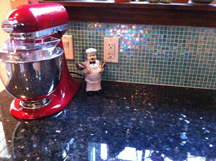 A closeup of the mixer (that started the kitchen hope chest) and little spoon man. 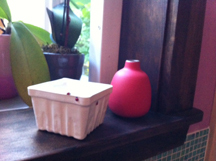 To the right of the kitchen sink is the espresso machine, toaster, bread box and, like several other places, a pop of red. 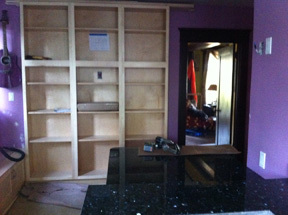 The bookshelves are beginning to flll. Can you figure out my organization system. It ain’t Dewey Decimal, that’s for sure. I confess it was inspired by Portlandia. CKC #49: The tile, it is up. 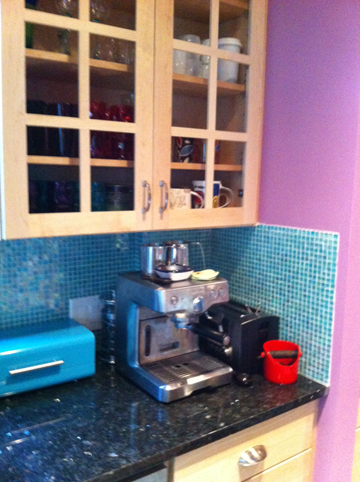 The backsplash tile went up today. 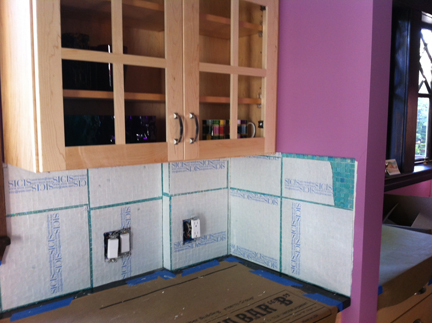 Now it needs to dry before the grout goes in. So nothing much to see here. 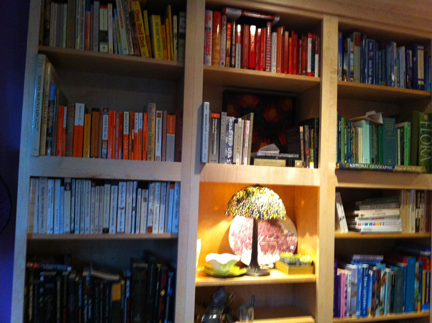 Well, actually if you look closely, you’ll notice a few things are beginning to appear on the shelves. I just couldn’t wait any longer to start populating them. 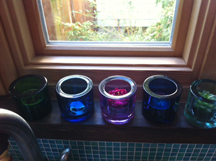 The gluey stuff, it is drying. CKC #47: Check, check, check, check! Countertop section removed and steel supports put in place? Check! 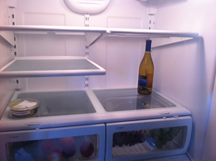 Wine chilling in new fridge? Check! Wine chilling in new fridge! 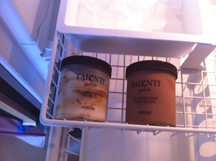 Ice cream waiting in pull out freezer drawer in new fridge? Check! This must mean we’re getting close! 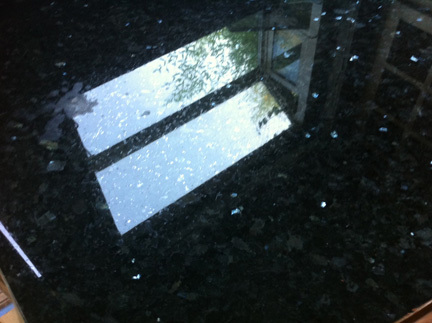 Filed under Cookless Kitchen Chronicles and tagged countertop repair, ice cream, kitchen makeover, new stove, talenti, wine chilling |	Comments Off on CKC #47: Check, check, check, check! CKC #46: Nothin’ like a home cooked meal. On Saturday we went to sister Sarah’s home in Longview for our annual birthday celebration. Four of us have birthdays between June 21 and July 21, and Sarah’s isn’t that much later (in September). Nephew Jeff is odd man out on account of being born in January. But he can’t complain too much this year, since his gift was attending part of the NCAA March Madness tournament at Portland’s Rose Garden. 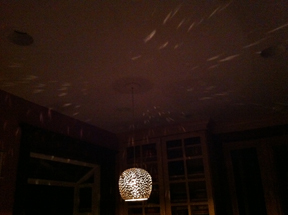 This year there was no question who would be hosting, given the cookless state of our kitchen. Actually, come to think of it, the Kosses usually host it because they have such an enormous and beautiful back yard, while our little postage stamp one is nice but anything but spacious. And our deck has been off limits to us this summer as it serves as a wood sawing and staging area. 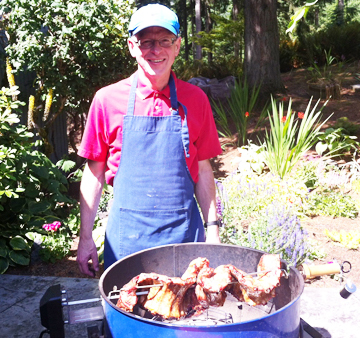 Brother-in-law Dave is known for his BBQ skills (and his pasta and pizza and deep-fried turkey!). Oh, yeah, his chocolate chip cookie pie as well. Yum. At our summer birthday celebration this year, he took on ribs. On the rotisserie on his BBQ. Ribs on a rotisserie????? Oh, yeah. 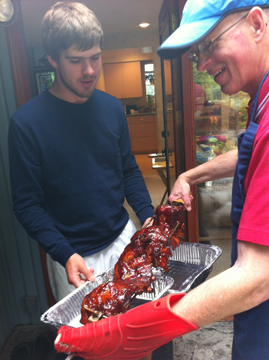 He put the ribs in a kind of sine wave, with the skewer through the meaty middles. Kind of like hand quilting, when you take the needle and weave it through an inch or so of fabric and batting at a time. With an amazingly delicious sauce. Take a look for yourselves. Now I can’t complain about our meals over the course of our cookless kitchen, but there just ain’t nothin’ better than a home cooked meal, is there? To go with our tasty ribs, Sarah made corn on the cob, potato wedges, baked beans and several kinds of summer fruit. We finished off the meal with a Seventh Heaven cake from Jaciva’s. Which is exactly where the cake took us. 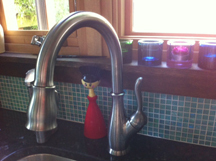 Meanwhile, back in the kitchen, Paul was installing the dishwasher and kitchen faucet. 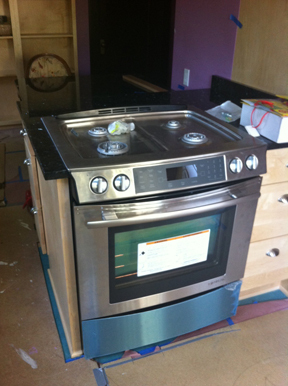 He tried to put the stove in, but it turns out we need a little trim on the granite before it will fit all the way. 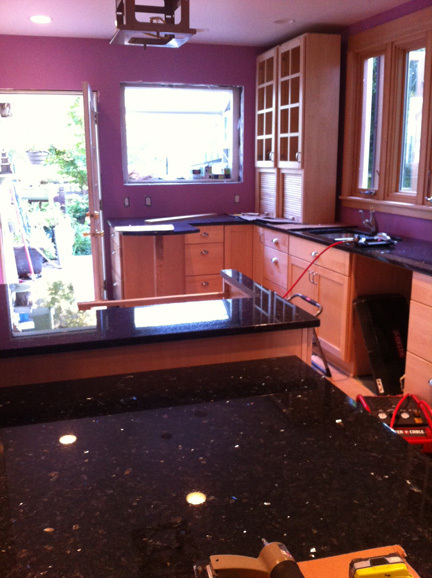 No problem, because the granite guys are due back tomorrow morning to add the missing steel support to the tablette. I’m not sure I want to watch. Please let the process not ruin the cabinets underneath. 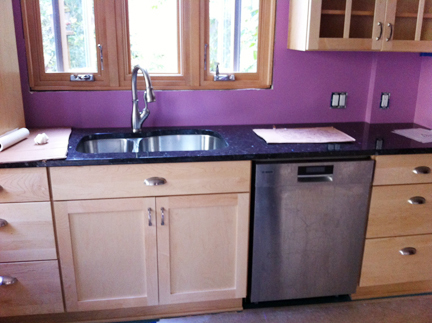 The counter has a sink, the sink has a faucet and the dishwasher is in. And working. Is that the light at the end of the tunnel coming in through the new window? Filed under Cookless Kitchen Chronicles and tagged BBQ ribs, birthday celebration, dishwasher, faucet, granite, kitchen makeover, sink |	Comments Off on CKC #46: Nothin’ like a home cooked meal.